In this handy ground-floor condo, you're just a short walk away from gorgeous Crescent Beach, the jewel in Siesta Key's crown. Enjoy laid-back beach living, from the open-air patio to the sun-washed living room! Jamaica Royale 91 redefines "easy." No stairs, no hallways, no fuss -- just walk right up and you're in! The patio will lure you right away, with its ultra-comfy chaise longues and chairs--sturdy, yet lightweight enough to be easily moved to follow the sun or shade as the day progresses. Wreathed in palm trees and tropical foliage, this is your private haven in Florida's most beautiful coastal paradise! The patio can become part of the living room at Jamaica Royale 91! Just throw open the big sliding-glass doors and you can link the sofa and easy chairs of the tiled living room with the lawn furniture of the patio. Are frosty cocktails and al fresco dining the order of the day?! The best thing about this lush garden view is that you can enjoy it from the entire living, dining, and kitchen area of Jamaica Royale 91. The sunshine and greenery seem to follow you indoors through the sliders, so even when you're prepping appetizers in the kitchen, you can look out at the beautiful Florida scenery. Of course, the living area can also be made private by closing the drapes. Gather your group around the big flat-screen TV after a busy day at the beach and enjoy some downtime together, or set up the Monopoly board at the roundtableand indulge in a little old-fashioned family fun. You have free WiFi at this condo, so you can also set up laptops and tablets at the table and begin uploading your vacation pics and memories. Stay as connected -- or as unplugged! -- as you want during your stay. The kitchen is galley-style, with granite countertops and sparkling appliances. You'll find everything you need here -- the whole Megillah of cookware, serving dishes, utensils, and chef's tools. Even if you're planning to dine out (and you should! Siesta Key has fabulous restaurants! ), take a peek in the well-appointed cupboards and drawers. You could prepare a homemade feast here, and you may be tempted to whip up some pancakes for the kids or some fancy nibbles for the grown-ups! If not, the coffeemaker, toaster, microwave, and blender stand ready to get you out of the kitchen and back into the action as soon as possible. Pick up some groceries and you're good to go in this efficient kitchen! The bedrooms at Jamaica Royale 91 ensure everyone of a great night's rest. The master suite is very spacious, with a king-sized bed, a cozy reading chair, dual lamps, a long window with lovely views, and plenty of open floor space. The en-suite bath offers both a shower and tub option and also has plenty of shelves and counter space for all your toiletries. The second bedroom is ideal for children, friends, and others traveling with you. Large and light, this room contains one double bed and two twins, sleeping four in comfort. White wicker accents and curtained windows add welcome touches to the decor, and a large dresser holds everyone's vacation togs. The second bathroom offers a walk-in shower and is convenient to both the second bedroom and the living area of Jamaica Royale 91. Towels are provided for both bathrooms, and sheets for every bed -- including the fold-out queen-sized sofa sleeper in the living room, which accommodates another two people. Best of all, Jamaica Royale 91 is just a hop, skip, and jump from the beach, located in a beautiful resort with three heated swimming pools, shuffleboard courts, gorgeous landscaping, and picnic/grilling areas. Come enjoy the Gulf Coast on one of its most magnificent beaches -- book Jamaica Royale 91 now! Location, facility, and beach were great! It was only the two of us, so we really didn't need the extra bedroom and sleeping included with this unit. Better bang for the buck for a family. Nice kitchen and more private patio area then the center buildings. The unit overall was accommodating, with the wifi an updated kitchen and shower in the main bath . Rest of it very dated feeling, and the bed was most uncomfortable but I'm use to better pillows and a contouring memory foam mattress. All in all, it was a nice facility with a perfect beach and good biking from location to the Siesta Key Village. Looking forward to going back to the area! We appreciate you taking the time to share your review with us. It was our pleasure to host you and we hope that you found everything to meet your expectations. You cannot beat the location and it sounds like you were able to take full advantage of the beach! We are always working on making updates to our unit and hopefully, the next time around, you will be able to showcase them to you. Again, we thank you for your feedback and we look forward to seeing you next time. Great location. Beautiful views and beach. Christina is excellent. Very attentive. Would stay here again. The Unit itself was great. Red Tide in Siesta Key made it impossible to enjoy the beach. The property itself was good. It was impossible to be on the Beach, and uncomfortable at the pool because of the smell from Red Tide. In light of the Red Tide issue, we are truly sorry about this act of nature. Red Tide cannot be predicted, although there are researchers investigating this possibility. We apologize that this has affected your vacation as this was not what we intended for our guests to experience. We hope that this will not deter you from visiting us again in the future as Fort Myers has so much to offer. We thank you for your feedback and we hope to see you the next time around. 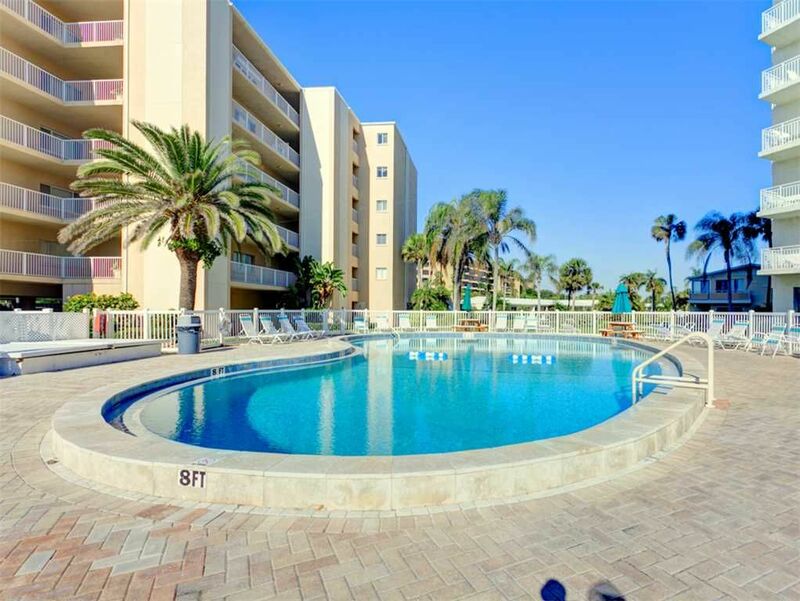 Convenient location to the beach, pools, and parking. Good location. Actual unit was somewhat dated but you can tell some updates are being done over time. Kitchen was nice. Bathrooms are ok. Furniture and beds could be updated. Decent value for the price. Not the nicest place we have stayed at. We had toilet problems for the first three days. Kept leaking on the floor. The toilet was finally replaced which solved the problem. Kitchen had very little space for food. Most of the cupboards were taken up by dishes. That many dishes were not necessary. No place to hang wet towels an suits. Needs some kind of clothes line. The whole place needs a deep cleaning. Especially the bathrooms. We will not return to this rental. I marked it that we loved it referring to the beach not the condo. Thank you for your review regarding your stay. This is unfortunate news and we apologize for the nuisances that you endured. We know things aren't always perfect which is why we take pride in our maintenance team's ability to problem solve as diligently and efficiently as possible. We apologize for any delay and we are happy to know that the toilet issue was resolved. Understanding your frustration, we are fully committed to doing what we can to make things right. Although you may have qualms to return, we do hope that in the future that you will reconsider and book with us again. Five sisters got together for a few days in the sun. We had an amazing time!! Jamaica Royale is an excellent location (three swimming pools, laundry room); the beach is right there and the trolley is available every 30 minutes to take tourists to Siesta Village. 91 Jamaica Royale needs some updating. The kitchen had recent updates and was stocked with everything you would need but the unit could use some fresh updates....pictures; more wall color, etc. While I'm sure the electrical outlets are safe; plugs kept falling out. With five people using chargers, hair dryers, etc. it was hard to find an outlet where plugs were secure. The patio had chairs but there was no outside table/umbrella. While walking around, we noticed many units did have a table.The living room furniture could be replaced; somewhat soiled from use but certainly not torn or disgusting. This unit was in a great location and we were thrilled to be able to rent it for our sister get together but, in our opinion, it just needs a little TLC!